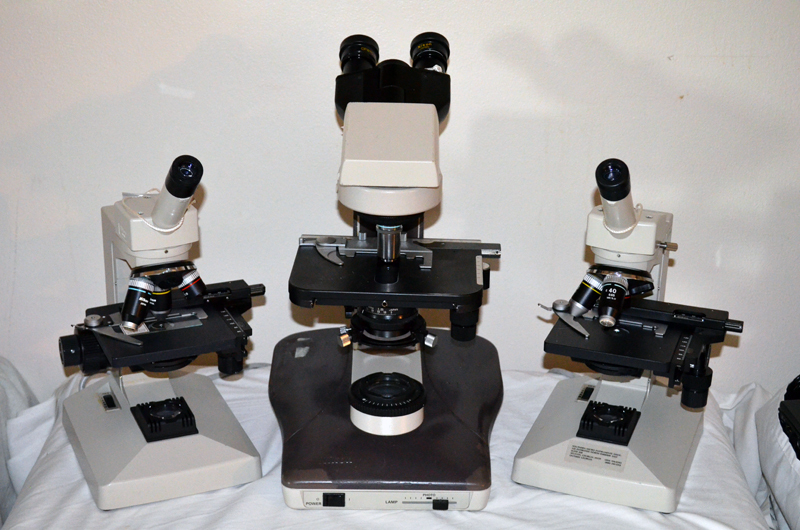 I am a self-confessed microscope hoarder. I am not sure how it happened, but I believe it began when I was a young boy growing up in the early 1960’s. I was given a small plastic microscope with a case for Christmas and I carried that around to ponds and streams for years. At one point, I was even introduced to a biologist doing research at the local university. He shared several prepared slides with me that opened my eyes to the unseen. I believe he saw a certain spark in me that I think he once had as a child. 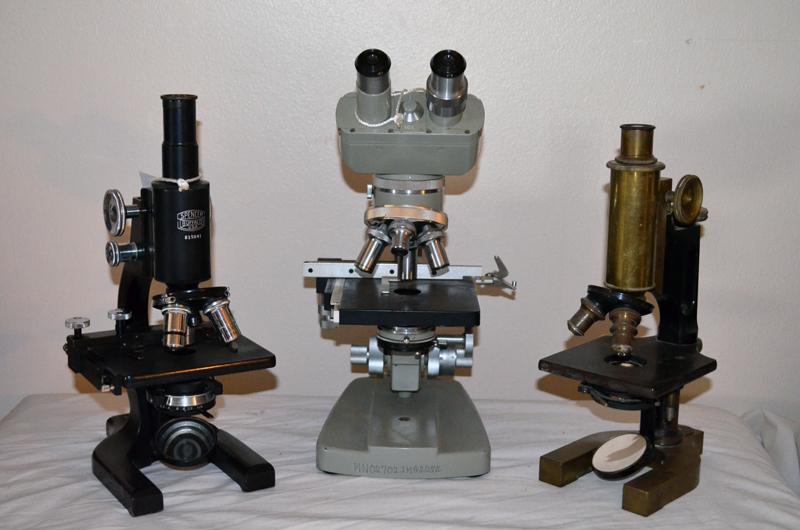 When I became a teenager, I was gifted an early 1900’s Bausch and Lomb monocular microscope by a local physician. It was made mostly of brass, and the optics were so much better than the lenses of my plastic microscope. That physician also saw a spark of raw curiosity in me. 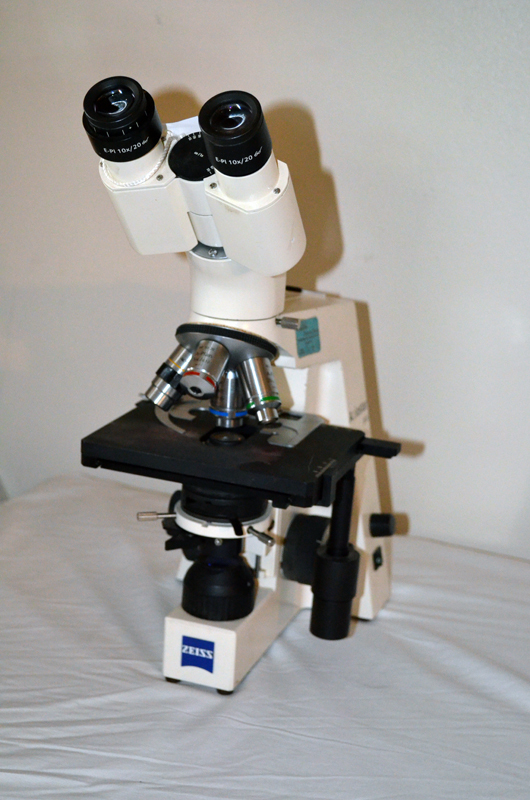 That ‘real’ microscope, I believe, changed my life forever. As I searched out specimens for my microscope, I am not proud of the fact that I entered some restricted areas that I never should have entered. I’m not talking about the occasional green pond behind barbed wire fences, or the slime puddles in the cattle fields protected by a big bull. I actually went dumpster diving in the local blood bank trash. While it is horrible to think of the possibilities of acquired diseases I might have been exposed to, I was only thinking of the specimen bounty. There were pints and pints of dark red blood along with test tubes filled with yellow plasma and such. I could only think about the hours and hours of microscopic observation of blood samples. I sneaked my bounty into my bedroom and began a weeks long preparation of blood smears and staining. Back then I was not thinking of my own personal safety or even using rubber gloves. My parents were “kind of” aware what I was doing, but they became painfully aware when a whole pint of blood leaked out onto my bedroom carpet. It looked like a horrific crime scene right in the middle of my floor. No matter what I did, I could not get all of that blood up from the carpet, and had to try to explain to my parents what had happened. The carpet had to be replaced. Not learning my lesson, I again went dumpster diving at the blood bank, but this time I got caught by the employees. To my surprise, they were not angry, but they were curious why I was doing it. Upon a trite explanation, the employees took me into the lab area and gave me a grand tour. They too saw that raw science curiosity in me because they had it when they were my age. They actually gave me some slides to look at, along with clean test tubes and a long lecture about if I ever did that again, they would call the police. That changed my life forever…again. Without the availability of blood products (other than my own), I needed to find a new supply of specimens to observe. That’s when I learned about hay infusions and the bounty of organisms it provides. I gained the knowledge from an old microscope book at the library (no Internet back then). I knew exactly where I would place the ‘liquid gold’ for a week while it was incubating. We had a gas water heater near the furnace in our house where I carefully placed the jar full of river water stuffed with hay from a horse field. I had more or less forgotten about the jar until after a week my mother asked if I knew what was causing the horrible smell throughout the house. My parents had become accustomed to asking me first if anything was awry in the house. I shook my head ‘no’, and then realized that my liquid gold must have been ready. I checked on the jar, and nearly retched. The smell was so bad that I was forced to move it outside immediately under demand of my usually calm mother. I was able to retrieve a few samples of the glorious slime at the top of the water. As I peered through the eyepiece, I could see multitudes of living organisms. Some were moving very fast, and some seemed to be swimming into every little nook and cranny. Yes, my life was changed again. School science fairs were a welcome opportunity to show off my science knowledge and skills. When I was 10, I did a project involving the hematology and serology of human and animal blood. Another year I tried the Scientific American Amateur Scientist experiment involving the electrocardiograph of the water flea. Of course it showed more ‘noise’ than actual heart activity but it was science fun, and it used a microscope to view the daphnia’s beating heart. My high school years were mostly filled with interesting things like girls and uninteresting things like a marching band. Some of the girls seemed to like to go wading through green ponds, but most were not. Receiving a hand me down car seemed to help my ability to seek out ponds and streams, but girls seemed to have other ideas. My college years were wonderful in that I was able to take actual science classes in biology, microscopy, and cell structure/function. I got a job working for a veterinarian so I had plenty of microscope time analyzing stool and blood samples for parasites. My slide preparation techniques improved daily. I also learned more about agar and Petri dishes and the microscopic bounty they provided. I won’t tell you that my life changed but I will say it was greatly enriched. So life went on, past marriages and kids and professional medical jobs. Alas, the years flew by and retirement finally set in. This is when I realized I didn’t have enough ‘stuff’ in my life. 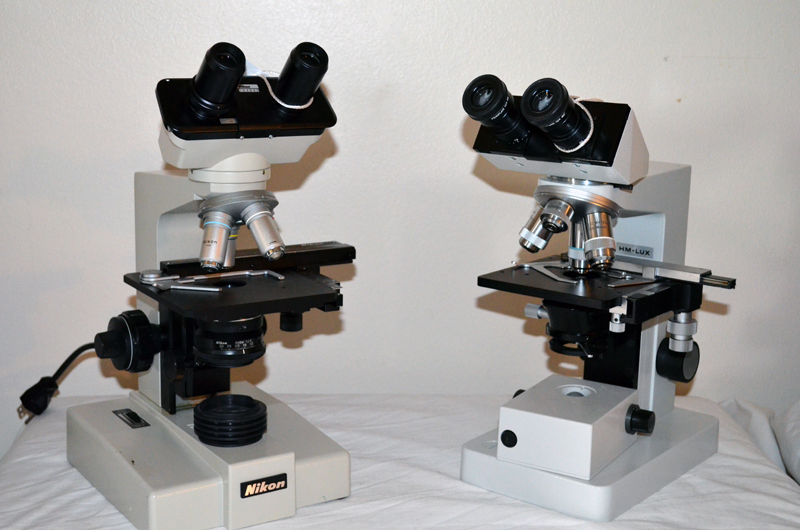 I had some money set aside and thought I would seek out another microscope to tempt my grandchildren’s science interest. I was gifted an Olympus metallurgical binocular, but found out that was very specific in the specimens I could view. I was rather leery about buying a scope on eBay, but I kept looking to see what was available. It was even amazing to think that I could order an electron microscope on the Internet. Then one day I discovered a new website…ShopGoodwill. I punched in ‘microscope’ into the search, and low and behold, there were many available. I bid on one, then two, then ten. 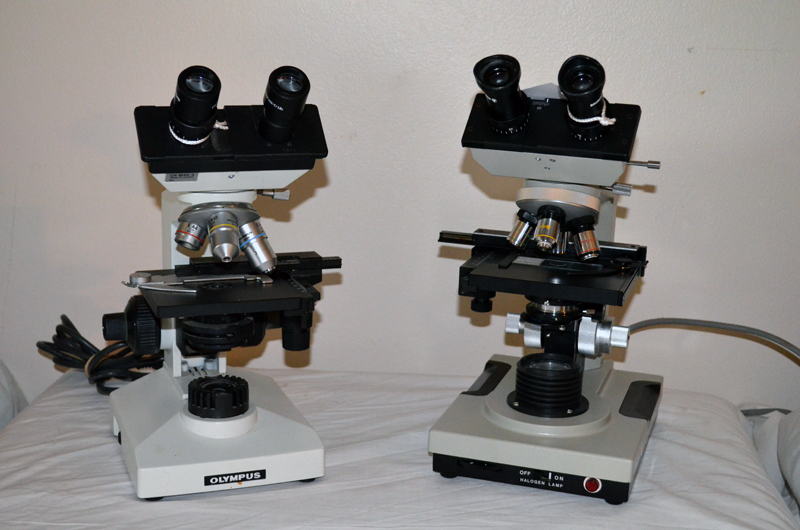 Before I realized it, I had acquired 20, then 40, and then 65+ used microscopes ranging from Leica to Nikon to Olympus, from monocular to trinocular, from hand held to classroom projector, from a student model to professional lab scope, from 5 dollars to 200 dollars. Don’t laugh, but this was in only a 3 month period. At first, I had to keep my bounty a secret from my wife, but it soon became obvious when the FedEx or the UPS truck was stopping at our house daily with a multitude of large size boxes. I quickly ran out of room in my office, so began inventorying, tagging, and storing the microscopes that I couldn’t use immediately. I had 10, maybe 15 good, useful scopes and I was amazed how excellent the optics were. Some had Plan objectives, something that I had only read about in journals. All of them had mechanical stages and Abbe condensers with working iris’s. Some were antiques, but most were from the 80’s forward. A couple, I think, I spent a little too much for, but it is too easy to get caught up in the excitement of the auction. 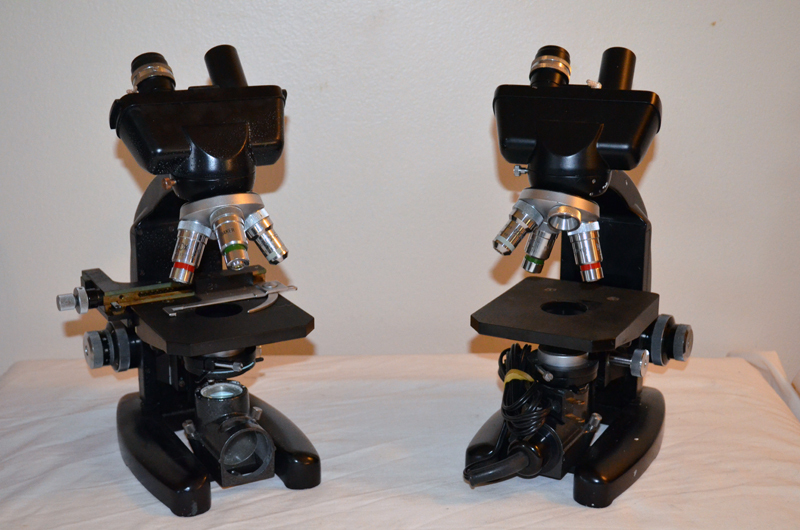 I was able to use my newly acquired dual-headed American Optical scope to help my granddaughter win second place at her school science fair with ‘Can a microscope be used to make 3D pictures’. 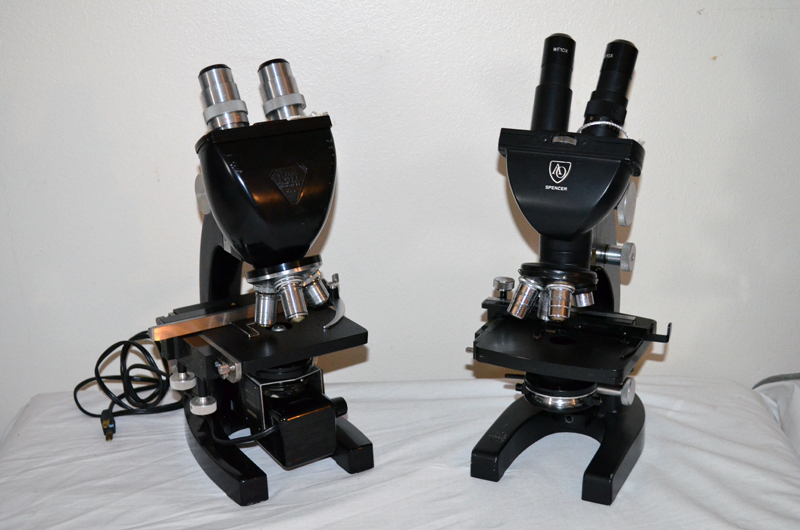 I have gifted a few of the scopes to my family and plan on donating a few to a local school. I never imagined that I could have found such a treasure trove of optical instruments from a charity donation website. Yes, most of the scopes have seen a lot of use, but they seem to be intact and able to provide many more years of enjoyment and excitement. I must say that this discovery has changed my life again, and I plan to change future generations lives by exposing them to the wonders of owning your own microscope. All comments to the author Kirby Kahler are welcomed. Two Cooke, Troughton and Simms. Published in the February 2019 edition of Micscape Magazine.